Branding a culinary institute within a community college in a food desert in Richmond, Virginia. Richmond's East End neighborhood is a food desert trailing behind other Richmond neighborhoods. As part of a larger economic revitalization initiative, Reynolds Community College approached Brandcenter with the task of positioning its culinary institute while highlighting its participation in East End revitalization efforts. Food options signal opportunity and invite interaction in parts of cities where previously there was none. In Richmond, we need not look further than Scott's Addition, a neighborhood that just 5 short years ago was home to little more than empty warehouse space but today boasts several restaurants, coffee shops and breweries. The launch of this new culinary program faces many challenges, including gaining community buy-in. We didn't think it was right that this neighborhood had been so overlooked by the City of Richmond, so we envisioned a school that made no compromises and challenged the traditional expectations held for East End residents. We seized the opportunity to challenge the injustice we saw in this disadvantaged neighborhood of Richmond and dared our client to think bigger and more creatively regarding the direction and impact of the school. We presented work that made no compromises for the residents of the East End neighborhood and for students of a community college. The location of the school is in a distressed district of Richmond called East End. The growth of Richmond’s food scene will require an influx of 3,000+ new culinary professionals each year - many at the mid-level. Reynolds needs to attract residents from the area as well as beyond and appeal to both students set to graduate from high school as well as older students looking for a career change or second start. Grow enrollment as quickly as possible, beginning now, and position the project to finish the construction's fundraising campaign. Position the Institute as a regional beacon for workforce, economic, and community development and gain national recognition for Reynolds Community College. WE COINED THE TERM "CULINARY DEVELOPMENT"
Culinary development speaks not only to the imparting of culinary skills, but also to the economic impact culinary businesses exert on their communities. 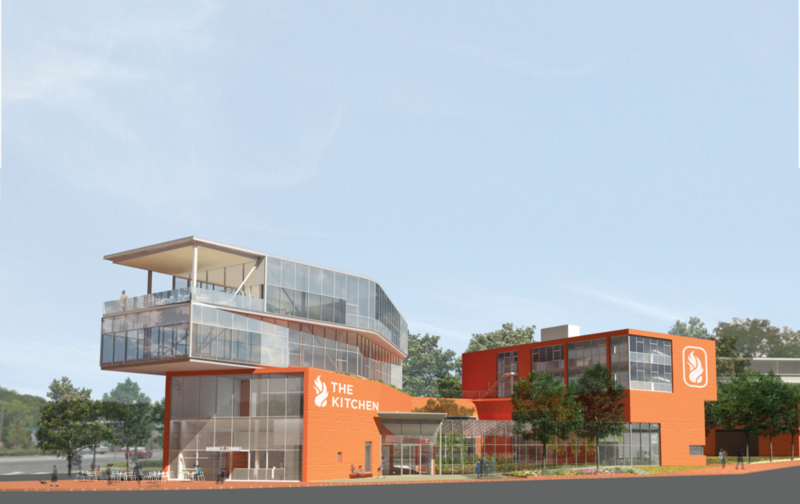 We envisioned this new culinary program serving as a sort of "ground zero" for both culinary and economic development, its impact emanating out and away from the school (epicenter) to influence the East End and greater Richmond region alike. Our strategy team wanted to inspire a brand identity and campaign for the school that could combat the negative stigma that persists against Richmond's East End community, especially since the school would be an anchor investment in the area. Due to inattention and imbalanced city policies, Richmond's East End faces drastic disparities such as a life-expectancy 20 years shorter than in other neighborhoods of Richmond, in part, due to poor nutrition and lack of healthy food options. Who says a culinary program embedded within a community college can't house a sate-of-the-art program with massively successful alumni? A program like this could help but Reynolds Community College on the map. We presented an identity and campaign bathed in Richmond's creative spirit and totally distinct from the monotonous identities and promises of other culinary schools focused solely on culinary discipline and excellence. A Thank You" box including a gift (branded cooking utensil, a Reynolds cookbook, etc.) and an engraved spoon to commemorate their donation to live in a permanent installation at the school. Canvassing the area revealed residents don't know what's coming. 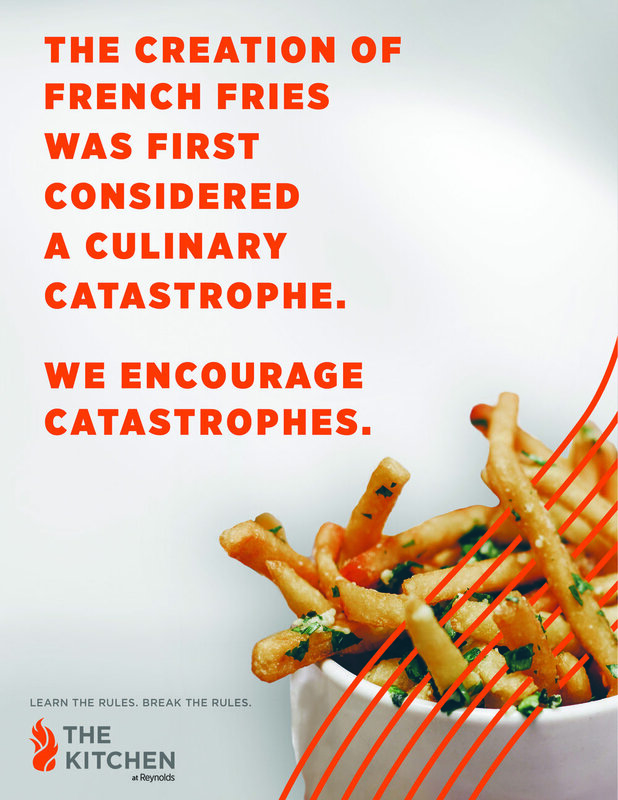 Tagline: Learn the Rules. Break the Rules. After presenting this work to college decision makers and community leaders, an East End resident met up with us to say, "Ya'll put the smackdown on that presentation." He said he loved the "Learn the Rules. Break the Rules" tag and was excited to share it with the high school students he mentors in the East End community. Community buy-in? Check. This work also led to my continued involvement in the East End development project. I was invited to form a team and name the additional projects at the construction site, a grocery store and a health wellness center, as well as name the development site overall so as to solidify it as an exciting, new point-of-interest and destination for East End residents. 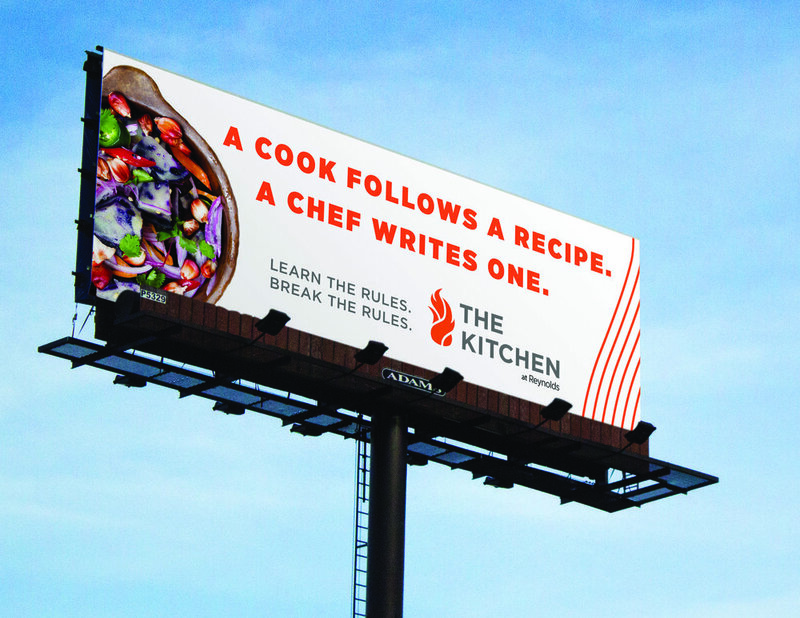 In a team of power-hitters, my biggest contributions to the project were in developing the brand positioning, identifying creative opportunities such as the "The Kitchen is Closed" construction signage, and leading off the pitch-winning presentation. I crafted and presented a compelling opening and strategy that hooked the client early, and my team didn't let up the entire rest of the presentation.